There was SpaceX. Then there was Tesla. Now there's Neuralink. We already have a digital tertiary layer in a sense, in that you have your computer or your phone or your applications…The thing that people, I think, don’t appreciate right now is that they are already a cyborg…If you leave your phone behind, it’s like missing limb syndrome. I think people—they’re already kind of merged with their phone and their laptop and their applications and everything. 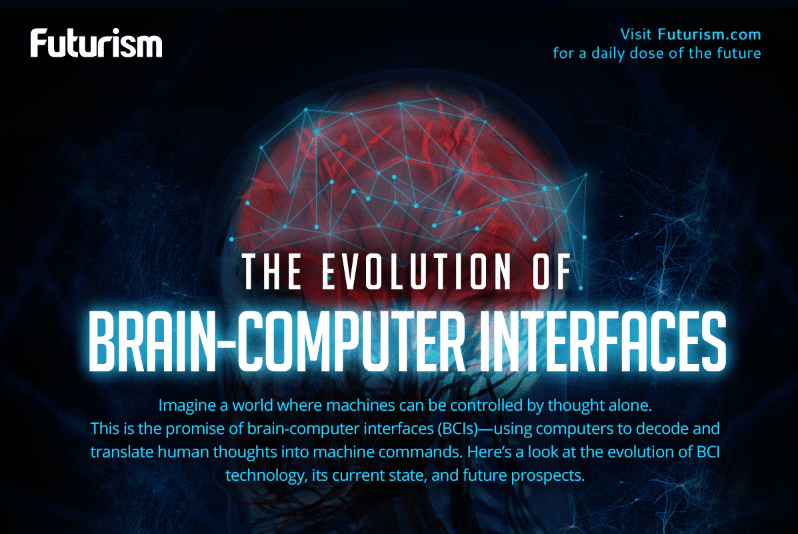 The goal of Neuralink, then, is eliminating the middleman and putting that power we currently have at our fingertips directly into our brains. Instead of one person using their phone to transmit a thought to another person (“Dinner at 8?”), the thought would just go from one brain to the other directly. Musk met with more than 1,000 people before deciding on the eight who would help him shape the future of humanity at Neuralink. He claims assembling the right team was a challenge in and of itself, as he needed to find people capable of working in a cross-disciplinary field that includes everything from brain surgery to microscopic electronics. The crew he landed is a veritable supergroup of smarties. They have backgrounds from MIT, Duke, and IBM, and their bios include phrases like “neural dust,” “cortical physiology,” and “human psychophysics.” They’re engineers, neurosurgeons, and chip designers, and if anyone can bring Elon Musk’s vision to life, it’s them. Neuralink won’t come out the gate with a BMI that transforms you into a walking computer. The first product the company will focus on releasing will be much more targeted. “We are aiming to bring something to market that helps with certain severe brain injuries (stroke, cancer lesion, congenital) in about four years,” said Musk. The same way SpaceX was able to fund its research on reusable rockets by making deliveries to the ISS or Tesla was able to use profits from its early car sales to fund battery research, these earliest BMIs to treat diseases or the disabled will keep Neuralink afloat as it works on its truly mind-bending technologies. Those are just two of the hurdles Neuralink faces. Elon Musk might make innovation look easy, but even going to Mars seems relatively straightforward in comparison to his plans for his latest company. First, there are the engineering hurdles to overcome. The company has to deal with the problems of biocompatibility, wirelessness, power, and — the big one — bandwidth. To date, we’ve never put more than roughly 200 electrodes in a person’s brain at one time. When talking about a world-changing interface, the Neuralink team told Urban they were thinking something like “one million simultaneously recorded neurons.” Not only would they need to find a way to ensure that the brain could effectively communicate with that many electrodes, they also need to overcome the very practical problem of where to physically put them. The engineering is only half the battle, though. Like Musk mentioned, regulatory approval will be a big factor in the development and adoption of Neuralink’s tech. The company also faces potential skepticism and even fear from a public that doesn’t want anyone cutting into their brains to install some high-tech machinery — according to a recent Pew survey, the public is even more worried about brain computer interfaces than gene editing. There’s also the not-entirely-unfounded fear that these computers could be hacked. Add to all that our still very, very incomplete understanding of how the brain ticks exactly, and you can see that the Neuralink team has its work cut out for them. Thankfully, they won’t be working to remake our minds alone — many other universities and research institutes are pushing brain interface technology forward. Facebook’s Building 8 is working on its own BCI, MIT is creating super-thin wires for use in brain implants, and other cyborg devices are already in the works to help the paralyzed walk again and the blind regain their sight. Each new development will push the field forward, and the team at Neuralink will be able to learn from the mistakes and successes of others in the field. Just like other electric cars were on the road before Tesla came along, brain computer interfaces are not new — the tech might just need a visionary like Musk to elevate it (and us) to the next level.